1. Developing testicular pain might be an emergency, especially if you’ve never had it before. Go to your medical provider, walk-in clinic, or emergency room if the pain is severe. One of the potential culprits of new onset testicle pain is testicular torsion, in which the cord that travels from your lower abdomen to the scrotum is twisted. This twist, or torsion, can cut off blood supply to your testicle and that is why quick intervention is needed. Oftentimes, a simple procedure such as an ultrasound is all that is needed to find out if this is the cause. 2. Even if not an emergency, testicular pain could be an infection or a mass, so making sure that all is well can ease your mind and help keep you healthy. It is also helpful to ease your mind so that you don’t worry too much about your symptoms. Some men find that worrying increases their testicular pain, and it is possible to create testicular pain by constantly squeezing your testicles to see if there is a lump! Doing self-exams is important, but you want to avoid over-doing the checking, and always apply a gentle pressure as the testicles are sensitive structures. 3. Getting a blow or kick to your groin is not an uncommon way to feel temporary pain in the testicles. Once the initial injury has calmed down, if pain persists, follow-up with a medical provider to make sure everything is healthy, and you will likely be advised to use conservative strategies such as a cold pack, rest, and maybe lightly compressive shorts to give a lift and support to your scrotum. 4. Sometimes the nervous system gets a bit overactive and can tell the smooth muscles around the testicles and scrotum to pull up, and up, and up. So much so that the testicle can even retract into the lower abdomen. Although it’s not always the case, for some men this can be very painful. Learning to identify the triggers for this such as cold, stress, low back pain and then identifying strategies to avoid or alleviate this issue can be accomplished in pelvic rehabilitation. 5. Because the testicles are supplied by nerves that branch off of your spine at the level of the low back, even a bout of low back pain may be related to developing pain in the scrotal area. Don’t be surprised if your therapist wants to examine your thoracic and lumbar spine, your abdomen, pelvis, or another nearby region. Many men who sit for really long periods of time every day have symptom improvement when they include more movement and less sitting into their day. 6. While having a vasectomy often involves a simple recovery with short-term discomfort only, sometimes pain develops after this procedure. In some men, a small granuloma forms at the surgery site, or a nerve that travels along with the vas deferens gets irritated. Rehabilitation providers have a lot of techniques and tools to help you recover from this discomfort. 7. A great way to develop new testicular pain is to start doing 300 sit-ups a day, especially if you haven’t been exercising AT ALL. I lost count of the number of men I’ve examined who decided, for some unreasonable reason, to start off a new exercise regimen with 200, 300, or maybe even 500 sit-ups per day, every day. 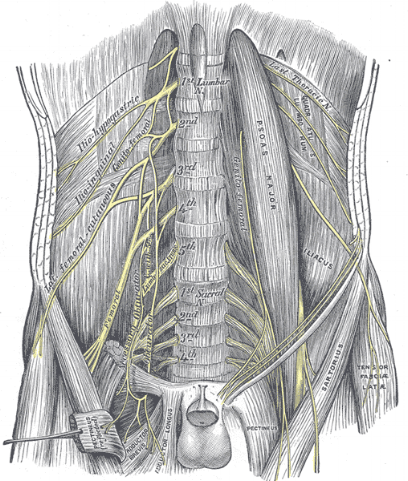 That amount of effort on the abdominal wall can really annoy structures such as the nerves that travel from your low back to the scrotal area. Remember this when you start planning, give your body a chance to gradually adjust and remember to stretch related areas like the hip flexors. 8. Some authors and healers have found a relationship between testicular pain and being worried about such things as your job, your marriage or relationships, and other important topics related to your emotional well-being. Fortunately, some men find relief from their pain when they are able to share with a mental health provider any worries or fears, anger that may be carried in the body. 9. No matter where your pain is, strategies such as deep breathing, focusing on what you can do to help yourself (and them doing them), visualization, gentle movement such as walking, or even a hot bath can be helpful. Just knowing that there are providers who are trained to help recover from testicular pain can ease symptoms by providing some hope and relief. 10. Most importantly, physical therapists and other pelvic health providers are trained to treat testicular pain, and much of the time, this treatment is simple and effective. Before you let anyone convince you to have a painful testicle removed (which might not even fix the pain! ), be sure to find a pelvic health provider to sort out how your body may be influenced by all the amazing structures involved.